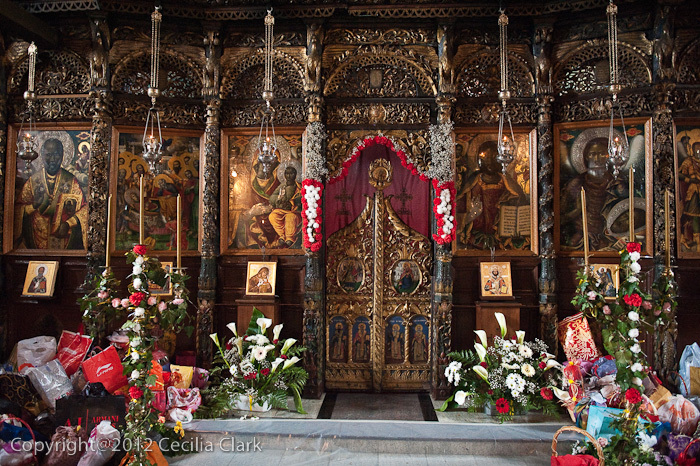 Orthodox Easter is observed over a 4-day period in Macedonia. Friday, April 13, is Good Friday and Monday, April 16, is a holiday for Easter Sunday. With a 4-day holiday it was the perfect time to see more of Macedonia. 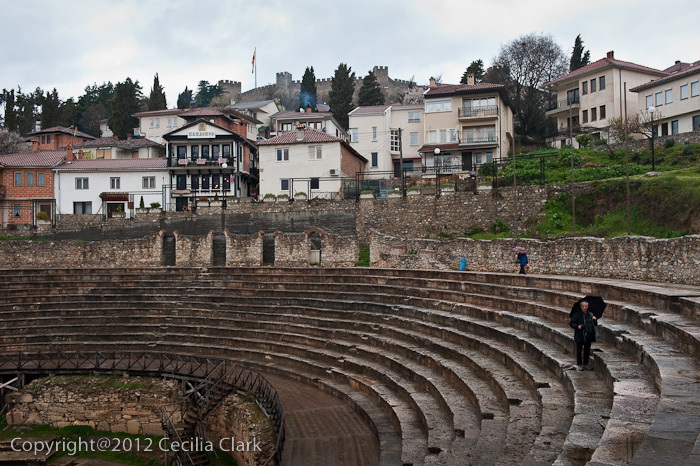 We hired a cat sitter, rented a car, and on Friday we drove to Ohrid. Ohrid is about 3-1/2 hours southwest of Skopje. Unfortunately, the weather forecast was for rain the entire weekend. About halfway, we stopped at "Мекиците од Стража" roadside cafe that serves all manner of fried or baked breads, called pies, stuffed with cheese, meat, or spinach made from a recipe developed in 1942. The pies are many layers of pastry shaped into a rope and coiled into a circle. The town of Ohrid is described as the "Jerusalem of the Balkans" and pilgrims and vacationers from everywhere visit Ohrid during Easter. Both the town and the lake are under UNESCO protection. The lake is one of the oldest in the world and the deepest lake in the Balkans. The town has roots back to Neolithic times and claims that it is the oldest continuous settlement of humans going back 7,000 years. The lake sits on the Macedonia-Albania border. When we arrived in Ohrid, we quickly realized that we weren't going to be able to locate our hotel easily. We were staying at the Grebnos Stone House Apartments within the walls of the old city. We called our host and he took a taxi to our location in the new town and directed us back to the apartment. Once we were settled in our weekend apartment, we bundled up and walked around the old city. At one time there were 365 churches, monasteries, and holy sites around the lake. Now there are about 70. We concentrated our visiting on the major attractions. We saw Sveti Bogorodica Perivleptos (Church of the Holy Mother of God Most Glorious) a late 13th C church and its gallery of icons dating to the 13-14th C. The exterior of the building is undergoing extensive renovation. The interior is covered with the original frescos that were covered with the soot of centuries until uncovered in the late 1970s. The diocese has a strangle hold on photos with no photos of any kind allowed. Just down the hill and past the upper gate we visited the 2000-year old Roman amphitheater. It was buried for centuries until it was discovered in the early 20th century. Now it is used for summer concerts. We dined at Damar Restaurant across from the church of St. Sophia. We were lured inside by the signs for lamb in a stove pot and pork cooked in honey. Both were delicious. After dinner we strolled down to the port and new town area. 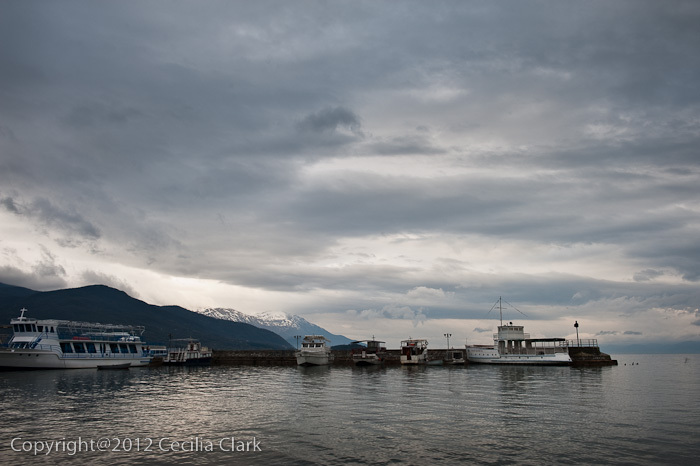 Ohrid Lake, the jewel of Macedonia, looked more like an Alaskan lake rather than a Balkan lake. 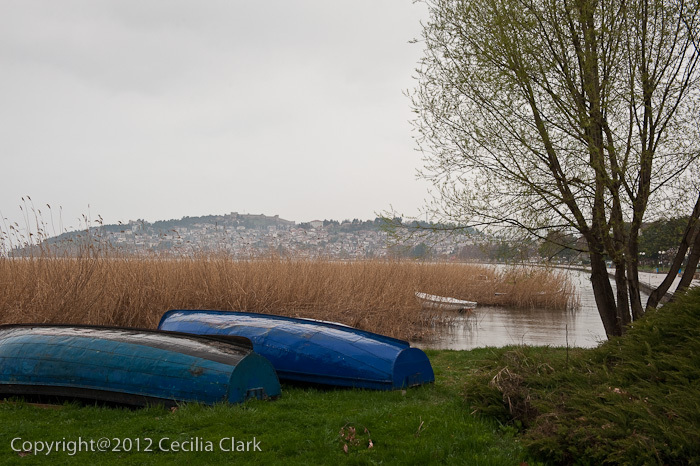 It was so cloudy that the distant shore was not visible making the lake look more like an unbounded ocean. 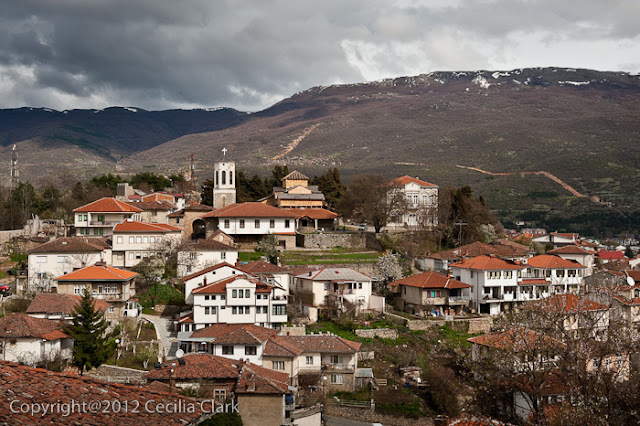 In the Ohrid's new town we could hear a church service beginning up the hill at the church of Sveti Bogorodica Kamenska. 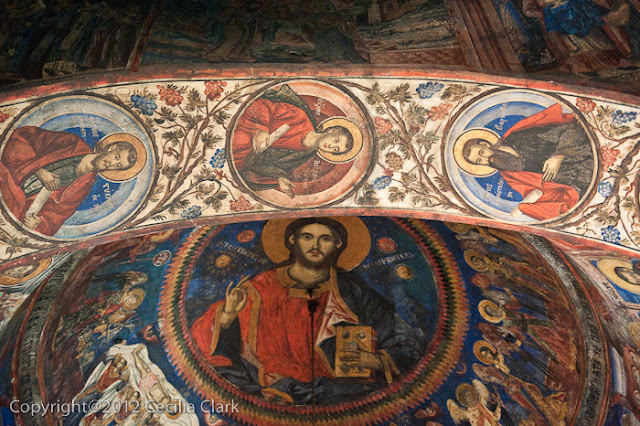 The church is not old by Ohrid standards dating to 1832. The exterior is not noteworthy, but the inside is fabulous. This Good Friday evening, the church filled with worshipers holding lighted candles. 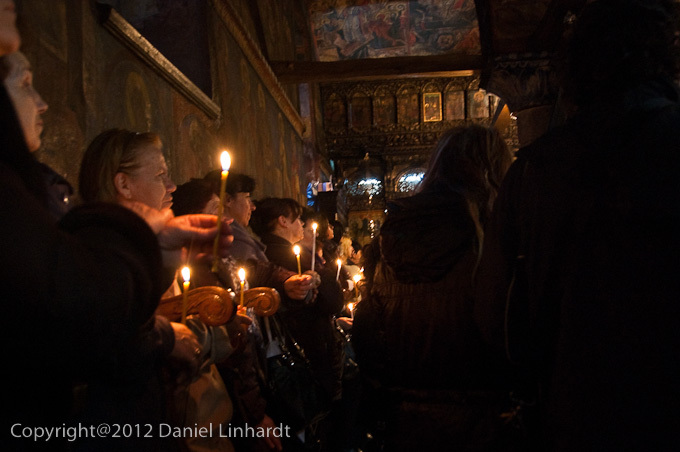 Many people lined up to pay their respect to a table of icons in the center of the church. The top of the table (similar to a gazebo structure) was decorated with a variety of fresh ivy vines and spring flowers. The table top was covered with a cloth that stretched to the floor. Some of the worshippers went under the table crouching there for a few seconds and then exited the other side. 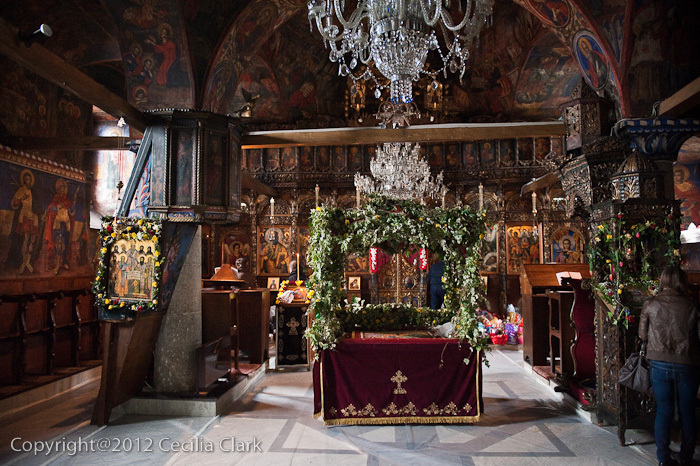 We've been told that this custom is peculiar to Macedonian Orthodoxy and the action symbolizes entering the tomb. One person told us that it is believed that this action can bring about healing. The priest and his young attendants sang passages and the congregation sang the response. It was beautiful. Dan with his stealth camera did take some photos, unobserved, during the service. We returned to the church on Saturday to take photos of the now empty church. The flowers decorating the table and the church column were beginning to wilt, but the interior was still beautiful and obviously well loved. The carpets and flooring were still covered with plastic sheeting to protect them from the extra foot traffic and wet shoes.